Confession #1: I love the Ocean’s 11 films. Confession #2: I love non-fiction books about art heists. Confession #3: I’ve been meaning to start the Bodies of Art series for a while now. I read a review of the first book that sounded like the perfect marriage of Ocean’s-style capers while recovering priceless works of art. Spoiler? They are right. I really enjoyed meeting Laurel Beacham. She’s funny, strong, and compassionate. And one heck of a thief. This outing begins with a mission to recover stolen art, but quickly takes a personal turn for Laurel when someone is murdered in her hotel room. Laurel and her boyfriend (and partner) Jack have the opportunity to travel to a few different locations as they chase down leads, trying to determine who killed the woman, and who is trying to frame Laurel for her murder. I loved the different settings throughout the book (the breakfast Laurel experiences in Paris sounds heavenly! ), and the art history facts that Ms. Ames effortlessly weaves into the story. It was especially fun to read a passage that centered around Arles, France the very evening that I arrived there. Such a great coincidence! I planned on starting with the first book, Counterfeit Conspiracies. Instead, I ended up beginning at the end, with the latest release in the Bodies of Art mysteries, Bronzed Betrayals. I had no problem jumping in at this point, although I think some plot twists from previous books were revealed, as they were relevant to this storyline. If you really don’t want to be spoiled, I would start at the beginning with this series. 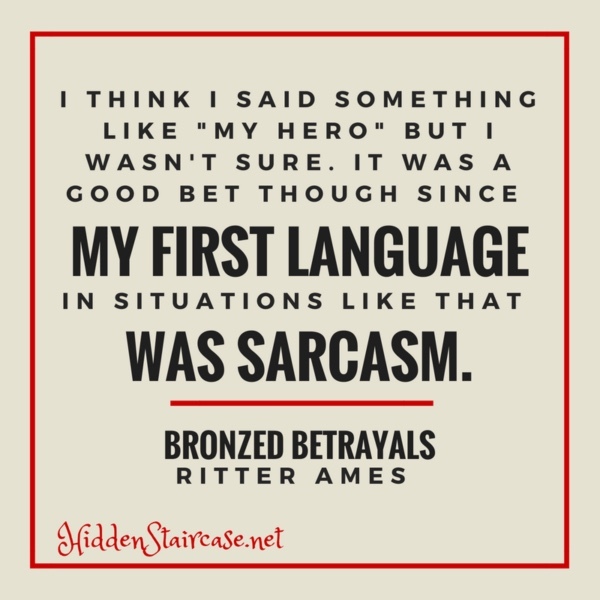 Overall, Bronzed Betrayals is a fun cozy with great characters that centers around recovering stolen art. I’m looking forward to catching up with the first four books in the series and spending more time with Laurel Beacham. I hope you enjoy the series as much as I have. The chance for arm-chair travel is worth reading it, but the complex characters and unique plot are the real reason I am hooked.